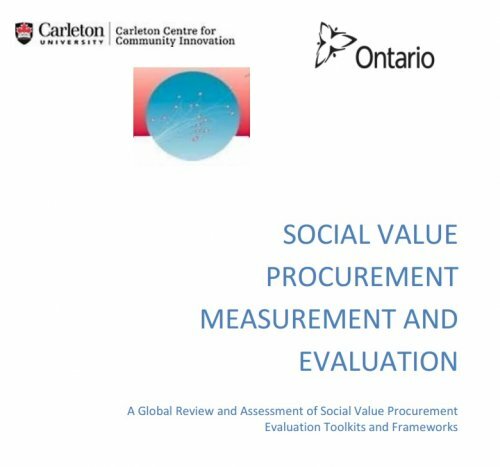 This research finds that successful social value procurement (SVP) evaluation frameworks share the following characteristics: a clear articulation of the end-goal, a transparent and consistent process for gathering baseline data that can be aggregated to provide a broader picture of SVP impacts, and a simple, built-for-purpose and proportionate approach that focuses on a small number of measurable outcomes developed through consultation with stakeholders. Evaluation is key to achieving SVP policy objectives, and the lack of progress on evaluation is a significant barrier to implementation. For contracting authorities, evaluation demonstrates value for money and accountability to the public. For social enterprises, evaluation allows for the articulation of their social value and the promotion of their own internal learning. For the broader procurement marketplace, evaluation contributes to setting new standards and norms and promotes a more competitive and diverse universe of contractors from which to purchase goods and services. This report reviews and summarizes key themes, challenges and lessons across twenty SVP evaluation toolkits and frameworks that have been developed by regional and national governments around the world. How social value is evaluated?